An Austrian colonel is being investigated on suspicion of spying for Russia, Austrian officials have said. The 70-year-old suspect, recently retired, is said to have been spying since the 1990s up until this year. Austrian Foreign Minister Karin Kneissl has cancelled her planned December visit to Russia over the scandal. Until now, Austria has been seen as one of only a few allies of Russia in the EU. 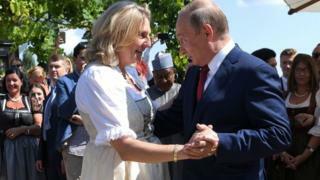 Russian President Vladimir Putin was at Ms Kneissl’s wedding in August. The EU has imposed a series of sanctions against Russia over its annexation of Crimea from Ukraine in 2014 and support for separatists in the east, as well as the poisoning of ex-spy Sergei Skripal and his daughter in the UK in March. But unlike most of the EU nations, Austria decided not to expel Russian diplomats over the Skripals. Vienna’s relations with Moscow have been under particular scrutiny since Austria’s far-right Freedom Party (FPO) became a coalition partner of the current government last year. The FPO has a “co-operation pact” with Russia’s governing United Russia party. And analysts also point out that Austrian officials have been calling for closer co-operation between the EU and Russia in key energy sectors, despite the frosty ties between the two sides. What is known about the suspected spy? 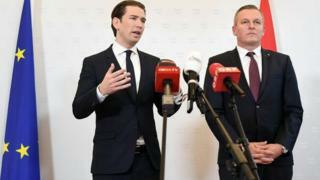 The news about an ongoing investigation into the case was revealed by Austrian Chancellor Sebastian Kurz at a press briefing in Vienna on Friday. He said that – if confirmed – such activities “can’t improve the relationship between the EU and Russia”. Meanwhile, Austrian Defence Minister Mario Kunasek said that the spying case came to light a “few weeks ago” with help from another European intelligence agency. The suspect’s identity has not been publicly released. However, Austrian media reported that the colonel had been extremely professional and had worked in the Austrian army’s control centre in the state of Salzburg. He is believed to have kept in touch with his Russian contact known as “Yuri”, using sophisticated equipment, according to the Kronen Zeitung newspaper. It says the Russians had been particularly keen on secret information about Austria’s air force, artillery systems and profiles of high-ranking officers. The colonel had been paid €300,000 (£261,000; $341,000) for his services, media reports say. It summoned Austria’s ambassador in Moscow, mirroring an earlier move by Vienna. Russian Foreign Minister Sergei Lavrov said he had been “unpleasantly surprised” by the latest news from Austria. “Recently our Western partners have made it a rule not to use traditional diplomacy, but instead use so-called ‘megaphone diplomacy’ by publicly accusing us and for explanations about matters we know nothing about,” Mr Lavrov said.